Instant Pot Rajma Recipe – This instant pot kidney beans curry is very comforting food when served with rice or roti. This rajma masala dish is very popular in Punjab, North India. 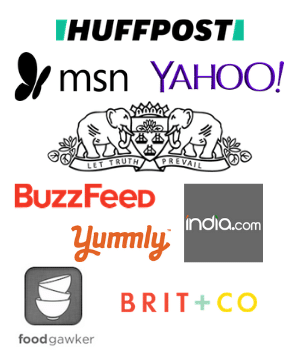 The traditional method of cooking rajma recipe is little time consuming compared to made in IP. In that you need to boil the rajma first in pressure cooker. Then onion-tomato masala is cooked in kadai and boiled beans are added. After that whole thing is simmered for some time so all the flavors get mingled. But when cooking rajma recipe in Instant Pot, we are dumping everything here and all will cook at the same time. The texture of cooked kidney beans should be melt-in-your-mouth kind. They should hold the shape still very soft and almost mash-able when pressed between finger and thumb. This red kidney beans curry is usually served with basmati rice. Hence the name rajma chawal. Because rajma beans takes around 25-30 minutes in instant pot, we can cook brown basmati rice using PIP (pot-in-pot) method here. Check the notes below in recipe card. If not, it tastes too good with roti or paratha or naan. This Instant pot kidney beans curry is vegan and gluten free recipe. Can I use canned red kidney beans? This curry can be made using dried kidney beans or canned one. I always prefer to use dried beans over canned product in my cooking. Just because it is economical and most important I prefer to avoid processed canned food. That’s why you always see fresh ingredients in my cooking here. But hey!! no judgement here, you can use either dried or canned. It’s your preference. I have mentioned the notes if using canned kidney beans below in recipe card. Yes, you must soak Kidney beans !! Dried beans should be soaked for overnight or 8-10 hours at least. Legumes have indigestible carbohydrates in it, with some verities having more than others. This makes you gassy and bloated. But the good news it, these carbohydrates are water soluble. So soaking will make the difference. Also you must discard the soaking water. and then cooking will break down the remaining carbohydrates and makes it digestible. and another advantage, soaked beans will cook faster. So, Less cooking time = Less time of exposure to heat = Less loss of nutrients. Another win-win situation!!! So always prepare / plan ahead of time. 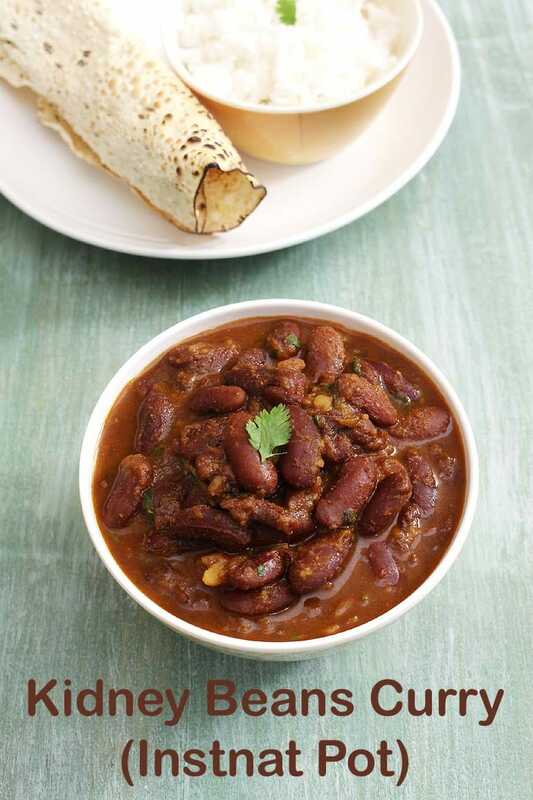 Soak the dried rajma beans ahead of time or day before. If you forgot to soak the beans a day before, here is the quick fix. Take washed rajma in a pan with enough water. Bring it to a rolling boil on high heat and let it boil for 5 minutes. Then turn off the stove and cover the pan with lid. Check after exact 1 hour, they should be at the same stage as you have soaked for 8 hours. Discard the water and beans are ready to cook. 1) Take red kidney beans in colander and wash under running cold water till water runs clear. 2) Soak them in enough water for 8 hours or overnight. They will get almost double in size. Discard the soaking water and keep it aside. 3) Turn on the saute mode of your IP. Once hot add oil and onions. Sprinkle salt and mix. 4) Cook for 2-3 minutes or till the onions get soft and light pink in color. 5) Then add ginger paste, garlic paste and slit green chili. 6) Mix and saute for 30 seconds or till the raw smell of ginger garlic goes away. 8) Mix and cook for 2 minutes or till the tomatoes become soft and pulpy. 9) Add remaining salt, turmeric powder, red chili powder, coriander powder and cumin powder. 10) Mix and cook for few seconds. Then add soaked rajma beans. 11) Also add water and stir to combine. Turn off the saute mode by pressing cancel. 12) Cover the IP with lid. Keep the valve on Sealing position. Press the manual button (high pressure) and keep the timer for 25-30 minutes by pressing + or -. Let it NPR (natural pressure release) . Once all the pressure releases, the pin drops, that time open the lid. 13) Now turn the saute mode back on and let it simmer. Also mash few beans using back of spatula, so the gravy will become thick instead of watery. 14) Now add garam masala and amchur powder. 15) Mix well. Once you reach the desire gravy consistency turn off the saute mode of IP. 16) Lastly add chopped cilantro and it is ready to serve. Serving suggestion: Serve instant pot rajma masala with rice. It can be served with roti or paratha too. Have some roasted papad on side for some crunch. You can have pickle or sliced onions and chaas on side. 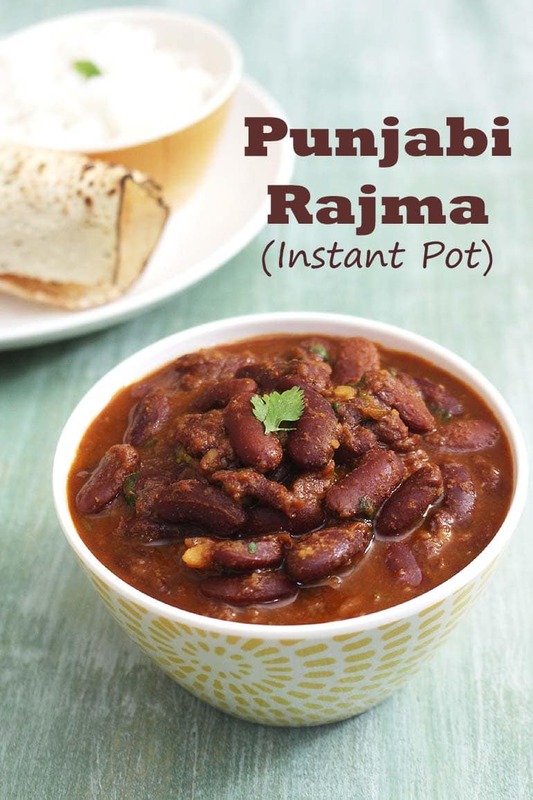 Instant pot rajma recipe - make the popular punjabi rajma masala (red kidney beans curry) easily and quickly using IP (Instant pot). Wash and soak the rajma for 8 hours or overnight in enough water and then discard the soaking water. For quick soaking, take washed rajma and water in a pan and bring it to a boil on high heat. Let it boil for 5 minutes, turn off the stove and cover with lid. Let it rest for 1 hour and beans are ready to cook. Discard the water and use kidney beans. Chop onion, tomato and prep rest of the ingredients. Turn on the IP with saute mode, add oil. Once hot add onion and little salt. Cook till onions are soft and light pink in color, for about 2-3 minutes. Then saute in ginger paste, garlic paste and slit green chili for 30 seconds. Add tomatoes, mix and cook till tomatoes are soft and mushy. Mix in remaining salt, red chili powder, turmeric powder, coriander powder and cumin powder. Add soaked rajma and 1 ½ cups of water, stir well to combine. Cover the IP lid. Turn off the saute mode by pressing cancel. And cook on manual (high pressure) for 20 minutes. Do NPR and then open the lid. Turn back the saute mode on and let it simmer for few minutes to get desire gravy consistency. Mash few rajma with back of spatula to get the thicker gravy. Lastly add garam masala, amchur powder and cilantro leaves. Mix and it is ready to serve. Traditionally, the rajma chawal dish has white rice (basmati or any other regular rice) served. When cooking in IP using PIP method rajma takes 25-30 minutes to cook and basmati rice takes only 4-8 minutes only. So we cannot cook basmati rice here like we did in instant pot dal fry. But brown rice takes 20-25 minutes in IP. So here we can use that for PIP method. Wash and soak 1 cup of brown rice for 30 minutes to 1 hours as time permits. If no time, no need to soak. After that discard the soaking water, take soaked rice in steel container along with 1 ½ cups water and pinch of salt. Follow the above procedure for rajma. After you add water, put the tall trivet in it. Place the rice container on the trivet. Cover with lid. Cook on manual (high pressure) for 25-30 minutes and let the pressure release naturally. Follow the same procedure with below changes only. Reduce the water quantity to 1 cup only. Cook on manual (high pressure) for 8 minutes. If using canned kidney beans then you can cook basmati rice (not brown rice) using PIP method because both gets cooked in almost same time. No need to turn the saute mode. Dump these into IP inner pot: 3/4 cup OTM, soaked rajma, salt, water, 1/2 teaspoon red chili powder. Cook on manual as mentioned above. Add garam masala, amchur powder, cilantro as mentioned above. Tried your rajma chawal recipe. Came out very well. Thank you.